Welcome to Omaha West Rotary! Last week, President Jill Slupe presided along with Secretary Nick Rosenberry. Ken Thomasen gave the Invocation and Don Otis served as Cashier. Bob Lovgren was Sgt. at Arms. Tarina Cox-Jones and Ben Kratz . 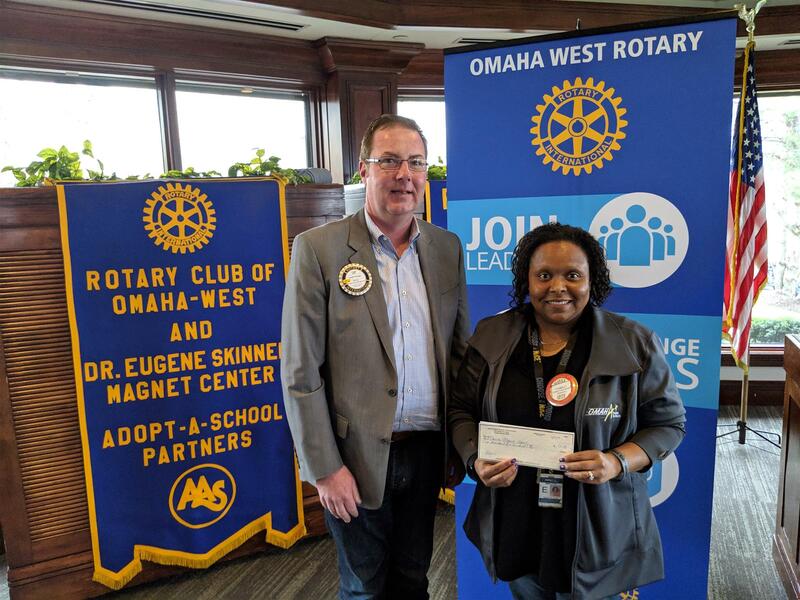 Joe Finnegan, President of the Omaha West Foundation, presented Tarina Cox-Jones with $1500 to purchase books for each student at Skinner Magnet School before the end of the year. Susan Thomas introduced Brandon Grimm who talked about how we will face the health challenges of the future. 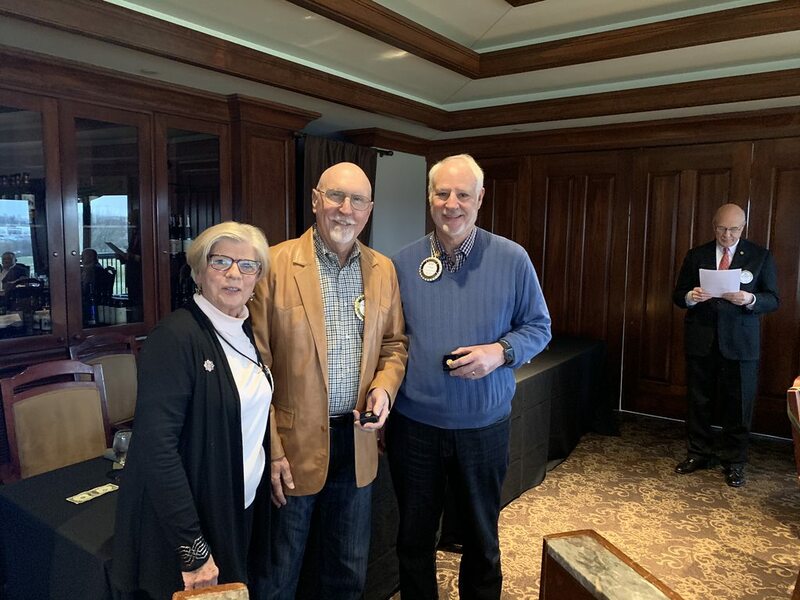 Last week Bonnie Gill recognized Butch Ethington as a Paul Harris Fellow +1 for his donations of $2000 to the Rotary Intl. Foundation. Ron Niederhaus was recognized as a Paul Harris Fellow +3 for his donations of $3000. Congratulations and thank you to you both! Last week Bonnie Gill introduced us to new member Deirdre Milobar. Deirdre was born and educated in Ireland. She attended St. Patrick's College of Education at the National University of Ireland & Majored in Special Education. She then taught in Dublin and Cashel for 9 years. Deirdre received a Rotary Fellowship to study at UNO. She earned a Masters' of Reading Diagnosis and Remediation as well as a Master's in Learning Disabilities. She went on to earn her PhD in Educational Administration-Special Education. She became a Reading Specialist with Council Bluffs Community Schools until 1998. 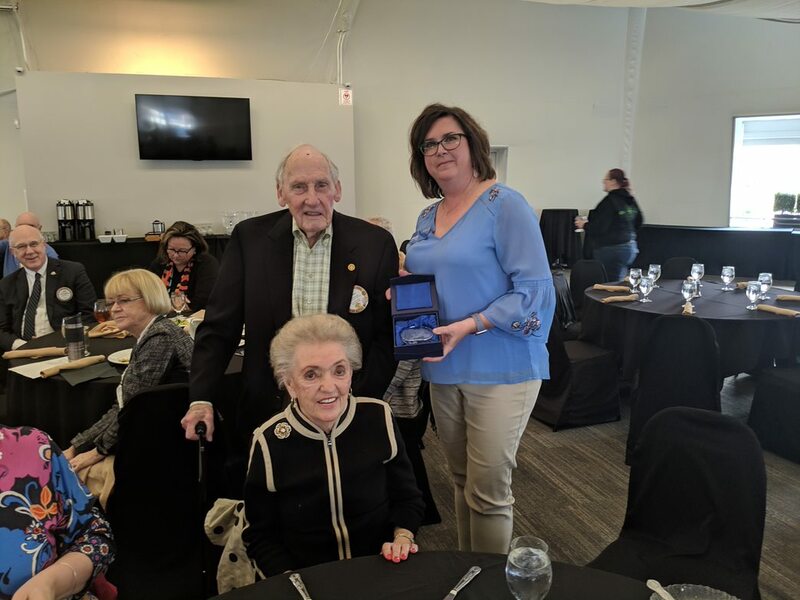 She also served as Principal of Madonna School Omaha (Special Education) 1998-2003 and then worked for Omaha Public Schools Special Education until retirement. Deirdre is an active community member having served on the Board of Directors of the YMCA Maple St, Community Alliance, and the Omaha Education Association. She currently serves on theCommunity Alliance Committee for their annual fundraiser "Breaking the Silence". She is also a Past President of Irish American Cultural Institute & the Nebraska Association for Disabilities. She is married to Leon Milobar. He is District Director of Small Business Administration. In her free time, Deirdre enjoys traveling, reading, walking, quilting, lunching with friends and sampling good wine. Welcome, Deirdre! to Del and and Phyllis Toebben who were recognized as Major Donors to the Intl. Rotary Foundation by District Governor Julie O'Hara. Major Donors have contributed $10,000 to the Rotary Foundation which supports projects around the world to promote education, literacy, and disease eradication. Thank you for your generosity and congratulations! Join the West Rotary Task Force! Please consider being part of the Omaha West Rotary Task Force meeting on April 24th at Champions Run from 12-1 to look into the future and brainstorm about future projects the club can develop and execute to make Omaha a better place. The Board would like this Task Force to identify projects, needs, volunteers and resources. We want your ideas, passions, and support. Cost is $16 for lunch. Please click HERE to register. Questions? Please contact President Jill Slupe. We are a service organization with projects that support education and building understanding locally, nationally and globally. Rotary is a worldwide organization of more than 1.2 million business, professional and community leaders. Members of Rotary clubs provide humanitarian service, encourage high ethical standards in all vocations, and help build goodwill and peace in the world. There are more than 34,000 Rotary clubs located in more than 212 countries and geographical areas. Clubs are nonpolitical, nonreligious, and open to all cultures, races, and creeds. As signified by the motto Service Above Self, Rotary's main objective is service - in the community, in the workplace and throughout the world. To find out about speakers at other Rotary Clubs in the area, you can conveniently see the list of Club websites here. Then click on the home icon to the left of the club name. The list of speakers are listed on their Homepage. 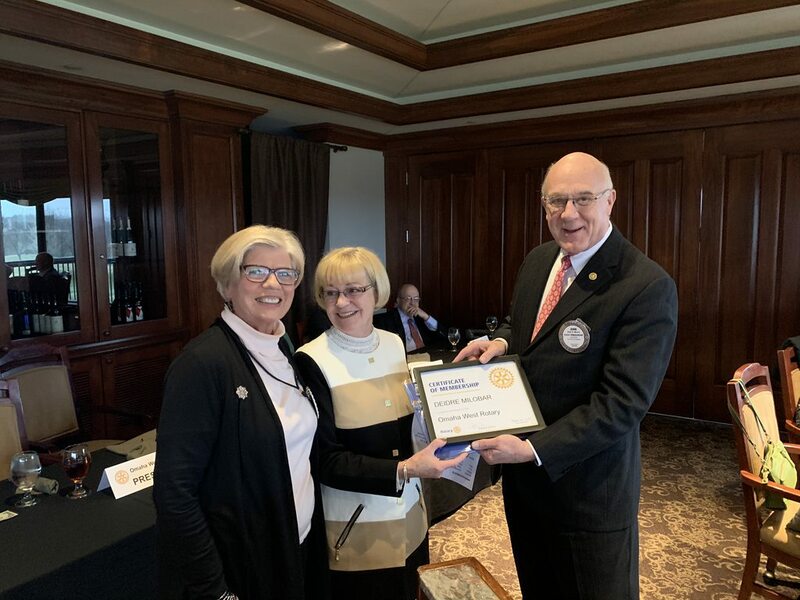 We are now known as the Omaha Rotary Night Club! Our meeting time has also changed, we now meet the first, third, and fifth Tuesdays of the month at 5:30 pm at DJ's Dugout at 176th & Q. Starting April 2, 2019, we will be changing all future meetings to Vincenzo's, 15701 Pacific St.